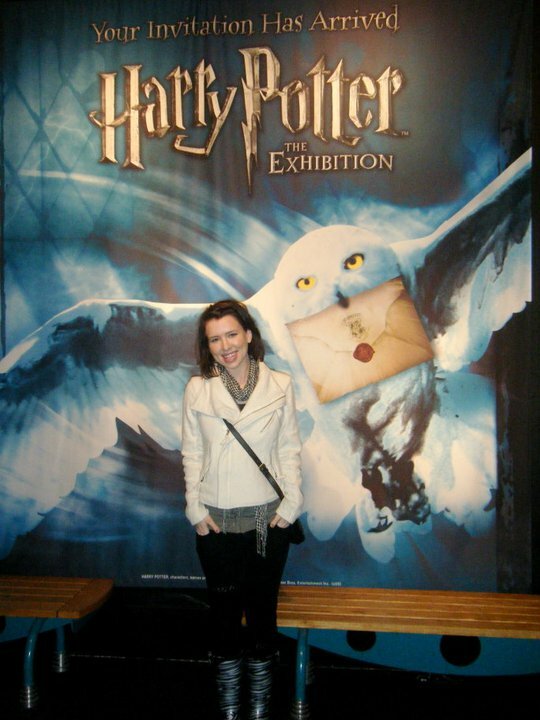 Amanda and I DID go see the Harry Potter Exhibition! Amanda wore the sorting hat and was put in the Gryffindor house, then we saw the painted fat lady trying to break a glass with her voice, read the fine print at the bottom of Dolores Umbridge's decrees (Blah blah blah), strolled around Hagrid's hut and sat in his chair, tossed a few quaffles in the rings and saw how big the great hall doors really are. What was really cool was seeing the costumes, and how small the three main characters were when it all started out! And to my disappointment, Amanda will not be attending U-Dub as the out-of-state tuition was way more than expected...but at least we got a visit out of it! And last weekend Matt and I put together our new bed!!! Hooray!!! Since we've been married we've slept on our mattress on the floor. On a free box spring on the floor. Then we bought a frame off Craigslist for $70 that we kept together with zip ties but was still pretty squeaky and wobbly. We finally ditched that and lately have used a plain metal frame that was propped up on bed raisers to fit drawers under the bed. After all that, we finally bought ourselves a brand spankin' new bed! The Hemnes bed, by Ikea. Knock Ikea if you want, but so far the bed is very sturdy, and though we thought our mattress was getting a sink hole in the middle it turned out it was the old free box spring, so with the Ikea slats its like having a new mattress! Roy tried to help put the bed together from inside the square until he drove me so crazy he was banished to outside the frame. So he lay wherever I was and stuck his nose underneath to make sure I was doing a good job. 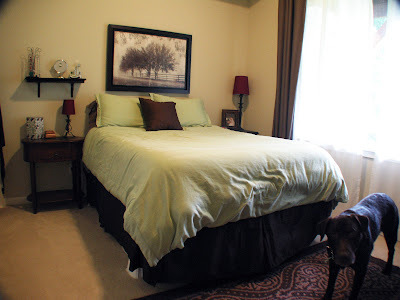 We rearranged our bedroom, too. Maybe this is my nesting phase coming out. Then again, I've always liked rearranging furniture. and yes it feels as cozy as it looks. I don't know why but it just cracks me up! Matt and I are big Seinfeld fans, so why not add a little humor to the bedroom? It tones down all the mushy lovey pictures. Hope you all are having a lovely weekend. Yesterday it howled and stormed but today dawned bright and beautiful and I'm off to take the Roy boy on a walk! I love the new bed. Looks great, as usual! :) I was just remembering how often we rearranged furniture in our dorm rooms!